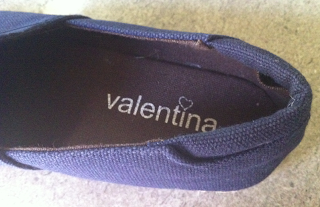 Valenitna has some adorable girl's shoes! These are high quality shoes that will last and feel good! My daughter needs to do some growing before these shoes will fit perfect, but when she does she will look fantastic!! Valentina is about inspiring the inner designer in your girl – bold choices, interchangeable designs, her own hand drawn art featured on her shoes is the essence of the Valentina Collection. Modern, innovative, hip, happy shoes that are designed by your daughter. Her soul and feet will thank you! I received a pair of canvas espadrilles and the stitching on these is so NICE! They are custom dyed in denim with an embroidered heart. They sell for $44. Also around the ankle is some cushion that would make these even more comfortable! These are great back to school shoes for any girl! You can even design you own shoe!! Order a Gwennie White or a Gwennie Red + White canvas shoe and then take some sharpie markers to it!! COOOOOOL!! Be sure to keep in touch with Valentina on Facebook, Twitter, and Pinterest for up-to date info, giveaways and sales! a Rafflecopter giveaway Giveaway will end August 8th at 11:59 pm. Sponsored by Valentina. I received a product for review. No other compensation was received. All opinions are my own. This promotion is in no way sponsored, endorsed or administered by, or associated with, Facebook. We hereby release Facebook of any liability. Winner(s) will be contacted by email and will have 48 hours after the giveaway ends to respond before another winner is picked. I <3 LOVE <3 the Clara Bubble Gum shoes! 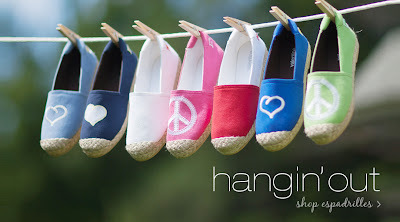 My daughter loves peace signs, so these would be perfect! I love the Avery charcoal! Clara bubble gum for sure! I love the Molli Tye Dye Plum! White design your own is my favorite! I like the Avery watermelon. Great giveaway. Thanks for a chance. I like the Gwennie red and the Gwennie white. Avery Turqoise Ballet Flats are quite cute! I love the white ones so my daughter can make her own designs. She is constantly drawing on her shoes. I like the Avery Charcoal. I like the Evie Shoe. I love the avery watermelon red ballet flats! The Molli Tie Dye Purple are cute ones! The kylie blue paisley at super cute! My daughter would love the Stella silver sandals or the Avery charcoal ballet flats. My daughter would be wearing the Avery Charcoal every day. Since my daughter's name is Kylie I have to go with the Kylie red paisley! Blue is my 11-years young daughter, so I think she would love the Kylie Blue Paisley! I love the Molli Denim (at least for today!) I really like alot of them and it's really hard to decide! The Avery Charcoal in the Ballet Flats are really cute shoes! I absolutely love the Evie flats. I loved them since I saw them on your blog post! I like the Kylie Striped for my niece. Avery Charcoal are my favorite! I like the Stella Chocolate sandals, but my daughter might have other ideas if I should win! Avery charcoal..or tye dye black..how can you choose..need a vending machine! I super love the Molli Denim!!! I like the clara bubblegum. I like the Stella Rainbow sandals. i like the molli tiedye blue, but i am not sure which my daughters favoite would be. I like the Molli Tie-Dye Blue Espadrille, but couldn't get the size chart to come up. Since they said they run small, really need to look at that. I love them all but Evie are my faves! Alicia Som amsstar5 (at) yahoo (d0t) com: My daughter would LOVE the Avery Charcoal ballet flats!! I would love to get those for her!! My daughter would absolutely love the Avery Turquoise. Blue is her favorite color, and those ballet flats are too cute! Well I wanted to be different but have to agree with most everyone else I love the Avery Charcoal and think my sister would too! Would love the Clara Apple! So cute! I love the Avery Charcoal. I like the Stella Silver. These are sold out right now, but my niece would absolutely love the Kylie Red Paisley. These are all too cute. I LOVE the Gwennie White Espadrilles!! love love love the Molli Tie Dye Purple!! I like the Molli Tie Dye Black. I love the Clara Bubblegum! How cute are these shoes!!! The Avery Turquoise are adorable. I love the Avery Turquoise! I love the Molli Denim. The hearts are adorable. Love the Clara Bubble Gum! The darling ones with the hearts on them are just so cute. My children at school would love them. I love the Stella Silver shoes! I love love love the Avery Charcoal. These shoes are so darn cute! What little girl wouldn't want the Avery Charcoal shoes! They are super cute!!! I would like the Clara Apple. Love the Avery Watermelon Red.